A proposal for Armagh, Banbridge and Craigavon Council to buy tickets to an Army Benevolent Fund (ABF) charity event has led to a war of words. Lurgan Sinn Fein councillor Liam Mackle said ratepayers would be “horrified” to know their rates would fund such an event. However, the DUP’s Mark Baxter said Mr Mackle’s comments were “ludicrous” while the UUP’s Arnold Hatch said it was a “typical response from Sinn Fein”. The council had been invited to send councillors to the ABF The Soldiers’ Charity (NI) ‘Ulster at War’ concert next month. The ABF is the national charity of the British Army and provides support to soldiers, veterans and their immediate families. At the last leisure and community committee, it was recommended that four councillors accept the invitation at £45 per person – a total cost of £180. Mr Mackle said: “We opposed a proposal that ratepayers foot the bill for councillors to attend a British Army fundraising event. “Many of the ratepayers that we represent would be horrified to know their rates are going to fund attendance at an event like this particularly given the track record of the British Army here in the North. Alderman Hatch said: “This is a typical response from Sinn Fein , namely one-sided and always against the British Army. “The leisure services committee were very reasonable in not taking a full table but merely buy four tickets for the event costing £180. “The funds raised will be to support our soldiers, veterans and their families who are experiencing tough times, who are of all religions and none. 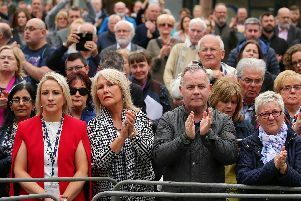 SDLP MLA Dolores Kelly said she agreed with Mr Mackle that if councillors individually wished to go to the concert and donate to the charity that was fine, but it was not acceptable that ratepayers’ money be used to buy these tickets. The ‘Ulster at War’ concert is described as a unique musical entertainment event. The charity is seeking to recreate 1940s Ulster by means of music, comedy and fascinating stories of local heroism from every corner of the Province. The concert will take place at the Belfast Waterfront Hall at 8pm on Saturday, March 24.